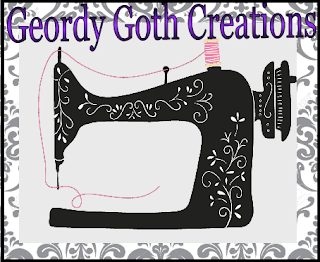 Tales From A Geordie Goth : DIY: A New Border. The new year has revitalized and given me the rocket up the kiester to start organising those annoying house jobs done. We've organised to move the boyfriend's things from the flat, I've started decluttering again and I'm finally reunited with my Pocket Dragons some have gone astray in the loft of no return. 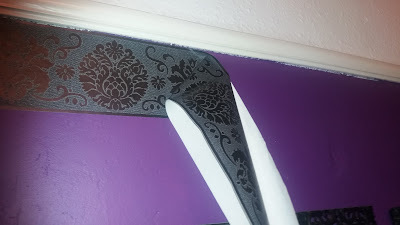 , I've contemplated using a border to finish the room off. I came across a border when zombieing (my word wander around aimless without a purpose) on the internet. I found the perfect border that appeared complimentary to my wallpaper on my chimney breast and another decor. Its called the Campbell Black Border I got from B&Q it cost £6 for a roll and each roll has 5 metres on. (After researching in the states Home Deport stock it). This was very easy to apply to the wall as it was self-adhesive but it was fiddly to apply as I was using ladders and had to move them. All I did was peel the back off, align the border with my picture rail bottom edge I just rubbed using my hand to smooth out any creases outs. At times I had unpeeled the border to get smooth as possible but it worked. I forgot to take photos to show the process. I'm really happy with the final result for £20 it feels as though finishing the room off. Checkly I had one roll left and return it get my money back as I didn't know what I would do with it. In total it cost £15, not bad. Disclaimer: This is not an endorsed post of any kind or any form of payment. I purchased the border with my own money. I just wanted to share my experiences and love for this gothic Victorian border. It makes a beautiful transitional feature between the lower and upper parts of your walls! That's exactly what I was trying to achieve with the border. Now, I've lived with it for a week,I loved it and feel it finshes the room off perfectly. It; lovely, I love it! You did an excellent job - it looks great! Looks great! Much more finished appearance! Thanks. I agree the living room looks far better. It matches the fireplace wall! Love the purple too! Thanks it's part of the reason I bought as it compliments the my feature wall lol. First I have to say, your room is beautiful!!! I love the layout and the height of the ceilings! Now I have to say, you did an amazing job Sarah! I loved your room before, but now, it's even better! A+++ I have to tell you something funny, your purple, is the same purple of my bedroom! LOL! Thank you that's so sweet of you to say. The ceiling height and space is amazing it's what I love about old houses. It does come with its problems. I love this house lol. That's interesting we have the same purple I guess great minds think alike. Mine Wilko' Wizard. Originally, I wanted to paint it mustard yellow the boyfriend said no. As I wanted a medieval church feel. I'm happy I went for purple. It really does finish the room off perfectly - and what a lucky coincidence it complements the wallpaper so well! I'm glad you think so.I'm can't believe I found such a lovely border not to mention how complementary it is to my feature wall paper. Thanks. Most my frames a cheap ones from cheap shops or charity shops spray painted.It was intentional to replicate a room. I just like the the modern thing for having collage or gallery of pictures. A lot of them are of photos I've taken it randoms I've found in charity shops. Looks lovely with the fireplace, really does finish the room off nicely. Thanks. Sadly, it's not original fire place but it does suit my decor though. Nice. I like how it goes with the fireplace. Thanks. It's I loved about the sitting room. Thanks I think it depends how you use them some can look aweful. I think luck enough this has worked really well.